My name is Paul Sancandi, and since 1980 I've worked in both undertaking and managing design for buildings and infrastructure projects. I have a solid technical background as a structural engineer, was an owner of an Architectural and Engineering (A&E) practice and have worked in Australia, Asia and the Middle East on a wide range of small to “mega” projects. I am now a Senior Design Manager consulting in Australia and am seeking to share my knowledge, experience and expertise on Managing Design of Building and Infrastructure projects. Managing Design seeks to establish project management practices that are primarily focused on enhancing the design process. For Infrastructure and Building projects the successful implementation of Managing Design throughout the entire Project Life Cycle can represent the difference between a superior outcome for the project in terms of Quality, Timing, Cost and Value or failure, given the complexity of Infrastructure and Building projects in today’s environment. Managing Design is however primarily focused on the Design Process within the project framework and as such is only a part of the overall Project Management of a project, albeit a critical part of the project. If you are going to be a successful Design Manager and achieve superior outcomes for both your clients and your own business, you cannot manage design haphazardly and expect consistent results. You must manage design projects by undertaking a proven stage by stage process. Our On-Line Courses outline those stage by stage processes and gives the Design Manager a step by step guide and the managing design tools to successfully managing the design of Infrastructure and Building projects. Let's work together to help build the profile of what we do and have it recognised within the overall design and project management framework and professions. The information below will explain what I am offering, and how you can take advantage of it. I recommend you read everything on this page. It will give you the complete story of the Design Managers Club. The first thing you want to know about the successful managing design of building and infrastructure projects is that it must be based on solid, proven principles and practices that work. As you know well, design is a subtle and complex thing and it needs a special and careful type of management. I've included everything I know about managing design of building and infrastructure projects into an online service I call The Design Managers Club to help make the design management and delivery of design projects easier and more effective for you as an individual or as a business. So let me tell you exactly what the Design Managers Club is and how it works. The Design Managers Club is an online membership site for Design Managers with on-line courses, articles, managing design resources and tools, peer groups, and a design manager’s forum for building and infrastructure projects. All the materials were developed for those who realize they need to become better design managers if they are to deliver projects more effectively and efficiently, improve their own or their company’s business by making more profit from their projects, getting repeat work and attracting more of their ideal clients, all more consistently and predictably. The Club was designed exclusively for design managers working for owners, developers, government organisations with in-house project management capability, project managers, architects, engineering firms and design & construct contractors. If you want to improve your managing design skills, the Design Managers Club is for you. The purpose of the Club is to give you what you need to become a better design manager and deliver the design of your projects effectively and efficiently. When you join the Club, you'll get access to all of the programs below immediately. And every time we create a new program or additional materials, you get it for no additional cost( except for the Manual as noted in Program # 6). We have developed and collected $ thousands worth of programs and design management how-to information in the Club. Below you'll find everything you need to know about the Design Managers Club. This program is the heart of the Club. Eight modules that include over 130 individual Topics that cover each of the 120 Steps in the Managing Design Process, lessons and assignments for each module that you can complete online and offline. This course is for design managers working for owners or developers, government organisations or project managers. This program is the core of the Club and includes very specific, hands-on and how-to instructions and tools for managing design. This program was developed from 32 years of experience and industry based knowledge and inputs. You can do the program at your own pace, reading and studying the material as many times as you need for it to sink in and doing the lessons and assignments at your own pace to suit your timetable. The online course uses the latest Moodle elearning software and system to deliver the online course.Similar On-Line Course Programs are valued at over $1,700. The complete program is included in the Club. All the online courses are to date not yet accredited, but they are practical and the principals and processes have been tested over many years on many projects. At the successful completion of the course you will receive a signed letter from me that you have completed the course with any due credit in performance noted. # 2 Program - The 120 Step Managing Design On-Line Course for Architects. Eight modules that include over 130 individual Topics that cover each of the 120 Steps in the Managing Design Process, lessons and assignments for each module that you can complete online and offline. This course is for Architects who are the design managers working for Architectural Firms who act as Lead Consultants for their projects. This program includes very specific, hands-on and how-to instructions and tools for managing design for Architects. You can do the program at your own pace, reading and studying the material as many times as you need for it to sink in and doing the lessons and assignments at your own pace to suit your timetable. The online course uses the latest Moodle elearning software and system to deliver the online course. # 3 Program - The 120 Step Managing Design On-Line Course for Engineers. This course is for Engineers who are the design managers working for Multi Disciplinary Firms who act as Lead Consultants for their projects or simply manage their own Engineering disciplines in house. This program includes very specific, hands-on and how-to instructions and tools for managing design for Engineers. You can do the program at your own pace, reading and studying the material as many times as you need for it to sink in and doing the lessons and assignments at your own pace to suit your timetable. This course is for design managers working for Design & Construct Contractors. This program includes very specific, hands-on and how-to instructions and tools for managing design for Design & Construct Contractors. You can do the program at your own pace, reading and studying the material as many times as you need for it to sink in and doing the lessons and assignments at your own pace to suit your timetable. 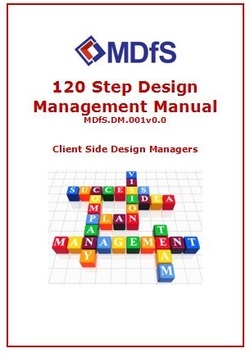 Within all of the 120 Steps in the Managing Design On-Line Course is a list of Managing Design Tools that are recommended to be used for that particular Step of the Managing Design Process. These tools include Templates, Guidelines and Checklists that will assist the Design Manager in setting up the project specific requirements within the documents required for the design manager to properly undertake the managing design process. Once the required and project specific documents have been created either from the provided templates and checklists or from the user’s own templates, the updated and live documents become the tools themselves to complete the Steps in the managing design process as noted within any particular Step of the Managing Design Manual. There are currently 49 Managing Design Tools that are included in the program and are included in the Club. To purchase these templates commercially would cost over $500. The above sets are a collection of researched materials on the subjects nominated that have been gathered from the web and projects undertaken by the author. These can be used as reference as appropriate and applicable. These are also available to Club Members. The Manual is a full working pdf compilation of the online course with active hyperlinks within the document taking you from one section to the other as well as hyperlinks to the soft copy design management tools for ease of reference and active step by step managing design of the project. A Manual can be set up by you specifically for a project with all the tools for managing design at your disposal which can then be tailored to suit your project so that the over 50 design management templates become the project specific managing design documents with active links from the Manual. This effectively creates a “live” working Design Management Plan (DMP) to guide you through all the design stages of your project. This Manual will be available to Club members at a substantially reduced premium once the online course has been successfully completed. The Manual is now also available for direct purchase, refer to the Design Managers Manuals Page. The Manuals can also be offered for customisation to suit your own or your company procedures. Included in the Club Membership is a free eBooklet of your chosen online course. The individual booklets provide the summary of 120 Steps included in the Online Course. "Design Managers Club Update" by email twice a month to keep you apprised about new things in the Club and upcoming additional features, courses, forums, conferences, articles etc. Within the online courses is access to Managing Design Forums, Chat rooms, Articles and Blogs where you can either actively participate in or simple join in to share your managing design experience, ask questions or seek advice. These are currently under development and will be rolled out progressively. 12. We are open to your suggestions for courses and their prioritisation. All the above will be progressively available to subscribed Club members at no additional cost. You get all of the above programs and resources, when you join the Club. You get immediate access to $ thousands worth of programs, resources and materials as soon as you sign up and then every month you get updates and access to new programs, courses and resources. And the fee for all of this is a fraction of the value of these programs. You get everything outlined above for only AUD $39* per month, less than $10* per week to invest in your career development and making your job easier. No up-sells, hype, or "secret material." We'll send you emails to get you to use what we have, not to sell you more. * For Australian Residents 10% for GST will be added automatically. Why so inexpensive? just happy to cover some costs while promoting managing design to like minded people like you. Before you subscribe as a member you can simply login in as a Guest to one of our four Free Trial Introduction Courses in Programs #1 to #4 above, no obligation and no formal sign up. Once you have completed the Free Trial Introduction Course that suits you, you can then subscribe, pay your first monthly subscription of AUD$39* and then get access to everything in the Club as mentioned above. If you don't want to subscribe, no need to do anything. If you want to end your membership at any time down the road, just let us know and we'll stop your membership and monthly payments, no questions asked. You can stay for as long as it serves you and leave when you're ready. You determine the value and stay for as long as you're getting that value. We keep delivering valuable information and support every month. The Club is new so we are actively seeking new members from relevant professional and client groups that have a vested interest in Managing Design for Success. These groups include, owners, developers, government organisations, project managers, architects, engineering firms and design & construct contractors. All you need to do is fill in the Form below and we will send you the Guest Password and Login Instructions pdf to the Free Trial Online courses for you to explore at your leisure. If you wish to subscribe to the Club as a member ,after the Free Trial, simply use the Contact Form on the Contact Us Page and let me know which course you are interested in. Please remember if you do decide to subscribe that you can end your Club membership at any time, so there is absolutely no risk to you. All I ask is that you give it an honest try for at least a month and see if you don't immediately learn a number of things that will be useful for Managing Design for Success for your project and your business.